Another new development by the Hexagon Group of Hotels, brand new wings: - villa-apartment style homely comfort in a resort environment, Three bedroom units, two bedroom units and studios, all beautifully furnished with a modern flair using local timber and resources. Three bedroom and two bedroom Villa-apartments have a fully equiped kitchen with 4 burner stove,large size fridge & microwave. Each unit has a dining suite and lounge area with TV its own washing machine and dryer. Two of the three bedrooms units have bathroom/toilets, with one Three beddroom unit downstairs having only toilet and laundry facilities. The two bedrooms units each have two bathroom/toilets. 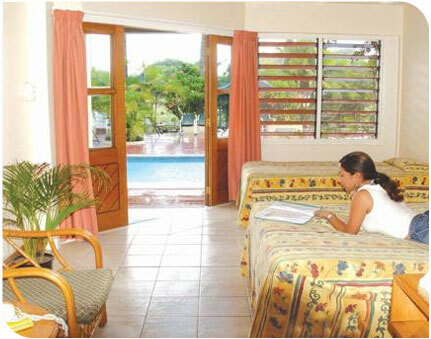 Off the lounge and master bedroom is a private balcony overlooking the tropical gardens and/or designer pool. Hexagon International Hotel Villas & Spa has 58 Deluxe rooms which are set on two levels and 35 of them overlook the large swimming pool and/or garden views. All deluxe rooms have been recently renovated and refurbished. The Deluxe rooms all have tea/coffee making facilities, refrigerators, clock/radio, colour television with Satelite TV containing 8 channels, air conditioner and some of 2nd floor rooms have balconies. Studio Rooms have kitchenette facilities,deluxe Family Rooms have Tea/Coffee making facilities. The 27 Standard air conditioned rooms all have tea and coffee making facilities, bar-fridges, clock/radio & hair dryer. These are situated at the rear of the Hotel.